1. Canada looks just like you’d expect Canada to look: a lot like the USA but with really good investment in public services and road signs in both English and French. 2. Canada is the second biggest country in the world. 3. Canada has almost half the population of the UK. 4. 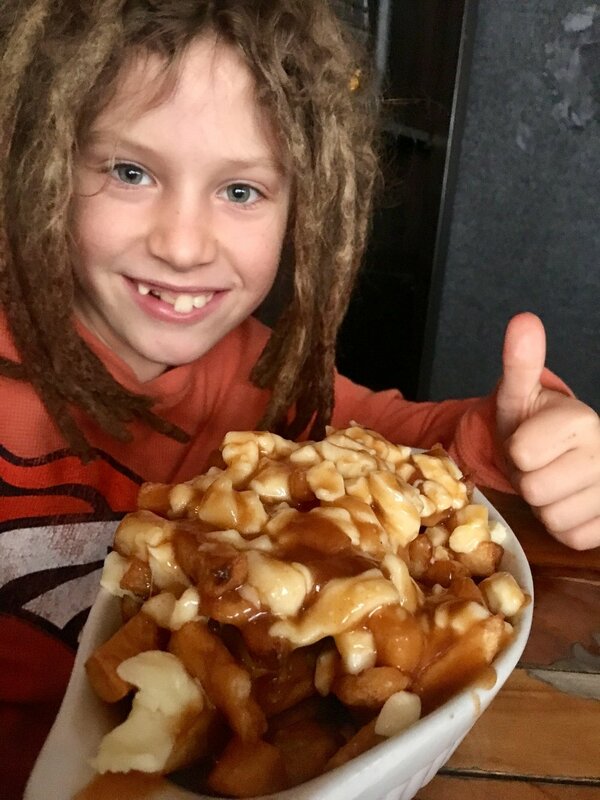 Chips (French fries,) cheese and gravy is called Poutine. It’s the national dish and best eaten at the end of a night out, apparently. We didn't get a chance to test this theory and loved it anytime of the day. Maple leaves on the floor. 5. The red maple leaf is on the national flag and it is everywhere you look during Autumn/ Fall. The trees literally look like they’re on fire. 6. Autumn is called 'The Fall' because the leaves on the trees falling to the ground is an actual event. Like the cherry blossoms in Japan, the falling of these luminous, rainbow-coloured leaves is a magical phenomenon. You can walk through the woods whilst the leaves flutter all round you like confetti. It really is amazing. A day at the pumpkin patch. 6. Sugar Maple trees produce the syrup. It’s a big deal to go to a ‘sugar bush’ in spring to see these farms tapping for syrup. These places are often pumpkin patches in autumn/ fall where you can pick pumpkins, kids climb hay bale mountains and ride tractors. 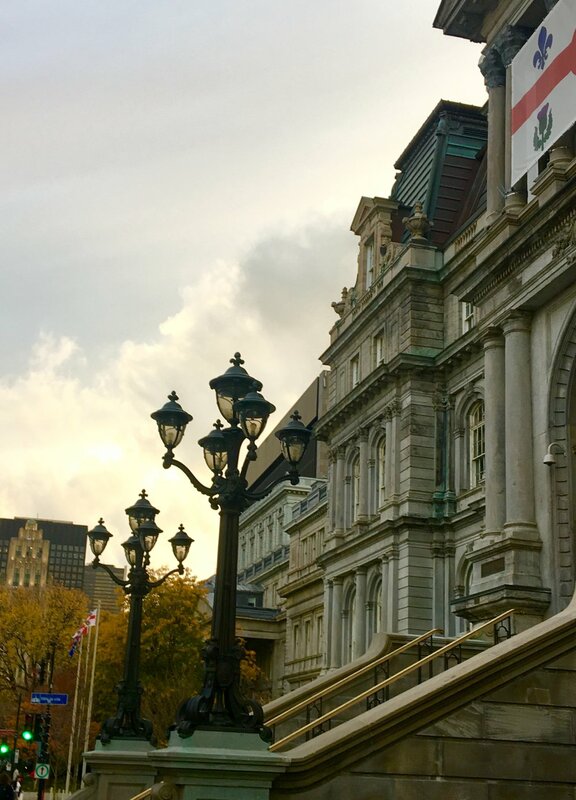 The town hall in Montreal. could be Paris, no? 7. Everyone talks about bears and wolves. They are ever present apparently but rarely seen. Chipmunks though? Everywhere. 8 Montréal is so French looking that Hollywood studios film there instead of shipping everyone to Europe. The inhabitants are more French than the French. 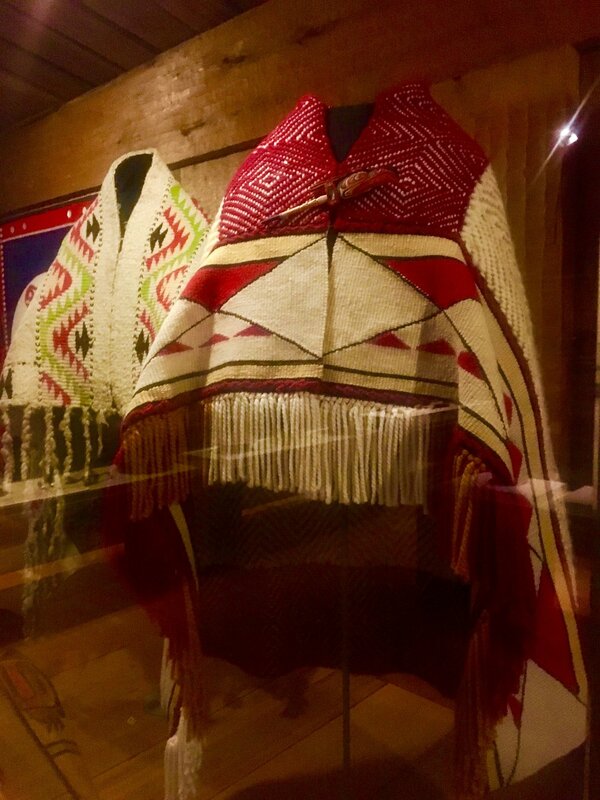 Indigenous wool shawls at the Canadian museum of history. Ottawa. 9. The French and British faught over control of Canada for 150 years. Much of Canada is bilingual. Most of the indigenous population did not survive. 11. The border police were incredibly friendly and polite. 12. Halloween is as popular as Christmas and celebrations start weeks beforehand. 13. It’s true, people in Canada really do love sports. Despite it being so cold in Winter, getting outside is a big deal- National Park trails become cross country ski routes. Cabins open up with communal fires along the way. 14. Niagara Falls on the Canadian side has a zipline that is definitely worth doing. 15. Have you seen Fargo? People do actually say ‘aye’ and ‘yah’ and it’s lovely. 16. We're definitely going back; the West coast is calling. Zipline fun. Archie is on the left. I’m on the right.